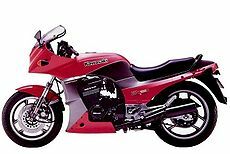 The Kawasaki GPZ900R was a revolutionary Kawasaki motorcycle design, in that its 908 cc liquid cooled 16 valve engine was a first for Kawasaki, and delivered 115 brake horsepower (86 kW) (depending on market). Although its steel frame, 16 inch front and 18 inch rear wheels, air suspension, and anti-dive forks were fairly standard at that time, it took Japanese superbike performance to a new level. It had a top speed of about 155 mph (248 km/h) (holding the record for the fastest production bike at the time), and a standing quarter mile time of just 10.55s was recorded by a specialist rider. Many changes were introduced in following years, including a change in wheel size. Though it sold in large numbers, Kawasaki ended production for Asian markets in 2003.